It’s been a while since I’ve seen a new twist on POV hardware. This time it’s ‘the Orb’ – comprised of a set of LEDs that rotate to form a sphere. Hopefully more docs are forthcoming. It looks like all the hardware except the motor is contained on the boards inside the sphere – maybe power is provided via the two ends of the spindle? 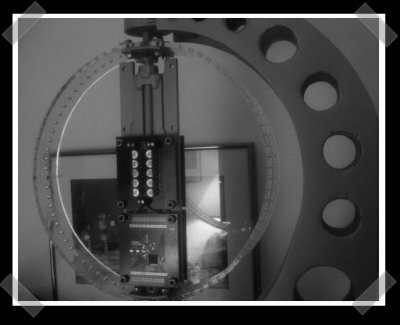 The visuals are driven by a pic C18 with hall effect sensors to provide position readings. Thanks to [phishinphree] for the tip. Don’t forget – 6 more days to get in your Design Challenge entry. I’ve gotten some great stuff so far – it’s going to be tough to choose a winner. oh my god that was so sweet! that is amazing! i wonder if they will post a video of it running. the globe looks unbelievable! they could probably make kits and a number of folks may go for them.. wait!! imagine multiple, smaller concentric rings within each other to add /depth/! that would definitely be worth persuing! That is AWESOME! I’d love to actually see this thing spin (and/or make one myself). think steve’ll like the led’s? we should get working on holographic stuff. Great ideas always come from independant inventors. Once I see a pic of it doing a Death Star, then I’ll believe it’s cool. I think that would be hilarious to see it doing the death star… and I would Def. buy a kit if they made one. What I think would be really awesome, is if someone did two or three rings, set like a gyroscope. Awesome looking globe. Gotta have a crack at knocking up one of those myself. Gotta agree on how damn cool a death star would be- colours couldn’t be easy to get right though. silic0re: instead of concentric rings, a disc should work too i think. Much simpler. seems like the batteries spin with it as a counter weight. Man that looks sweeet. Can’t wait for some videos of it in motion. Speaking of video man that would be super cool to display. Eventually I bet we will see it. that is a really sweet idea..
however this project really has too few led’s to properly be considered a hack.. every good hack has lots more led’s. The one with the two motors and spinning disks seems backwards to me. I would use a shaft that had two hub motors and a spiral pattern of slots cut into the disk towards the edge of the motor to allow for optical sensors to act as a resolver.Thus giving a location of the disk at any given moment. Being that they would want speed and not torque, the hub motors would work well for this application. This would put the weight of the system to the center and allow for an unobstructed view.